Power Stop brake kits include a complete set of cross-drilled and slotted rotors, red powder coated brake calipers, and Z36 extreme performance Carbon-Fiber Infused ceramic pads. 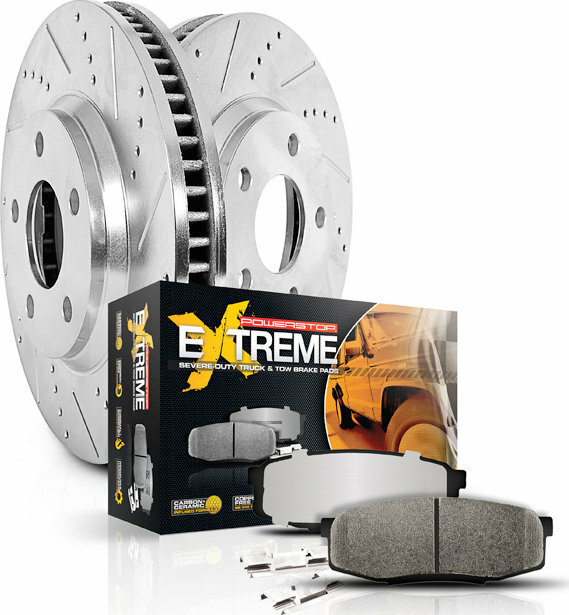 The Power Stop brake kit offers more pad bite than other leading brands without noise and dust. Not only do the brake rotors and calipers look great behind stock or custom wheels, they perform better than stock as well! Every caliper is expertly remanufactured, lubricated, and pressure tested in our Chicago, IL facility. If you need a fast, easy and affordable solution for better braking and better looks, then you need the Power Stop brake kit. Dont just stop, Power Stop!